For over 50 years, Swab’s solid fiberglass animal transport vehicles have been relied upon by humane societies and animal agencies for their durability and humane treatment of animals. Swab offers two models of our Animal Rescue Fiberglass (ARF) body. Both models come with a hefty package of standard equipment and are available with a wide range of options for you to build your perfect truck. All Swab animal transport units are easily transferable to other chassis. Best of all, Swab animal transport trucks are designed with the humane treatment of animals in mind! Swab has recently introduced the ARF6V (van conversion) for both Ford and Chevrolet Tradesman vans. The vans are outfitted with the same Swab moulded fiberglass animal compartments that have been used for decades on our all-fiberglass bodies. 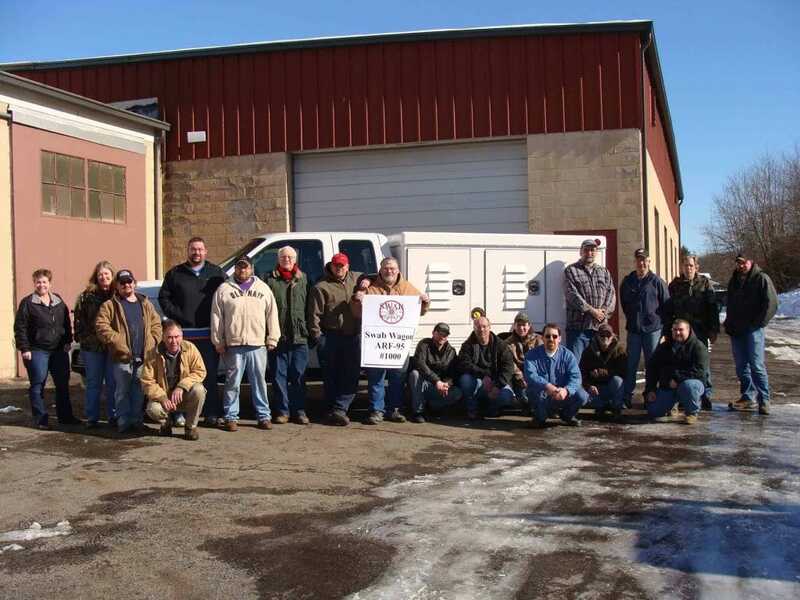 All Swab animal transport vehicles come with a 2-year warranty. With over 150 years of continuous operation, we’re sure you’ll find your Swab ARF is exactly what your animal agency needs. We are proud to present out 1000th Vehicle! Full 100% fiberglass-reinforced plastic construction throughout. Tubular steel crossmembers – molded into bottom of unit. Fully enclosed on underside. Roof reinforced underneath to provide adequate strength and durability. All body lights, reflectors, rear stop, tail, turn signals, back-up, and license lights installed. Auxiliary 4-way rear flashers, red lens. Heavy steel rear bumper installed with aluminum tread plate. Mud and splash guards installed at rear wheels. Each compartment constructed separately to prohibit contact with animals in adjoining compartments. Compartments finished with smooth, rounded corners to facilitate cleaning. Drain pan in front of each compartment with drain hole. Compartment openings flush all around. No door frame or roof rail protrusions to hinder removal of animals or cleanout. Compartment doors molded with five (5) extra large louvers on outside panel. Stainless steel door hinges and latch equipped with cylinder locks, all keyed alike. Standard large equipment compartment longitudinally between rear animal compartments. 750 CFM Fresh-Air Blower System installed to distribute oxygen. Standard Full Through compartment with center divider door. Are You Ready to Build Your Perfect ARF-95 Animal Transport Vehicle? Click the button to the right to get started with our comprehensive quote form! Extra Heavy Duty Cage Doors with Slam Latches. 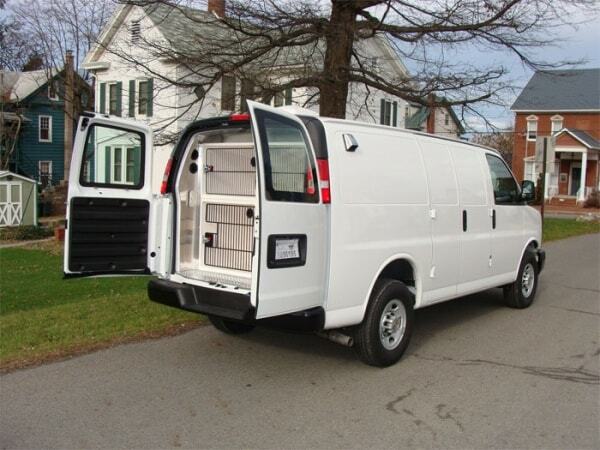 Are You Ready to Start Your ARF-6 Animal Transport Van Conversion?